Chutney is a form of relish with South Asian origins. Fruit chutney became the mainstay of South Africa's food bottling industries over the course of the twentieth century. South African chutneys such as Mrs. Ball's are now world famous brands distributed in the UK, America, Australia and other parts of Europe. Chutney itself has its origins in India and other parts of South Asia. With the mixing of cultures through colonization by the British in India, traditional jams were seen to increasingly incorporate more savory ingredients as well as spices. The Dutch had already brought South Asian slaves to the Cape by the time chutney had gained popularity in Europe as a luxury food item, however, the popularity of chutney in South Africa came about through Cape Malay influences during the Dutch slave trade of Malays and Indonesians. The Afrikaans word for chutney is blatjang, which may have possibly stemmed from Indo/Malay roots of a word describing chutney. If you observe Mrs. Ball's chutney, you will find the word "blatjang" written as the Afrikaans translation, implying that chutney and blatjang is one in the same thing. 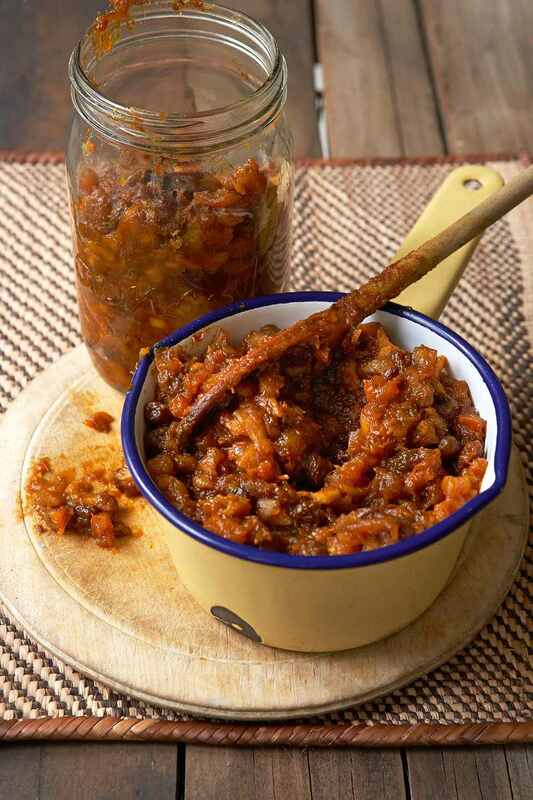 However, many South Africans will still make a distinction between fruit chutney and blatjang, with the latter almost always consisting of fresh or ​sundried apricots, extra heat from chilies and a smoother consistency. Whichever word you choose, it is fair to conclude that every blatjang is a chutney, however not every chutney is a blatjang. Soak the dried apricots whole in just enough boiling water to cover them; allow to soak for about an hour. This allows them to re-hydrate and become plump. Chop them into chunks, reserving the water to aid in dissolving the sugar. Blanche the peaches in boiling water and then place into a pot of cold water in order to remove the skins. Chop or dice the onions. Place all ingredients into a pot and heat gently for 20 minutes. This action primarily allows the sugar to dissolve thoroughly. Now allow the chutney to simmer at medium heat for about one hour without covering and stirring occasionally. Do not worry if the mixture still appears to be runny; it will thicken once cooled. Once ready, allow it to cool for 10 to 15 minutes prior to bottling into hot, sterilized jars. Keep sealed and allow to mature for two weeks to a month prior to consuming.